It Had to Be You by Jill Churchill, a Mysterious Review. 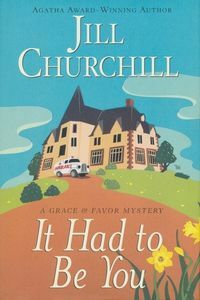 Review: It Had to Be You is the 5th mystery in the Grace & Favor series by Jill Churchill featuring siblings Robert and Lily Brewster. It's always a puzzle when an author goes to great lengths to set up a conundrum in a mystery they have written, then do nothing to resolve it. Such is the case with It Had to Be You. On the dust jacket, this query: "... who would bother to murder [the old man] when he had so little time left?". The Chief of Police ponders on numerous occasions the same perplexing aspect of this crime. Yet, in the final chapter of the book when the culprit is identified, no mention is made of why the murder was committed so close to the man's natural death. Fans of cozy mysteries will undoubtedly appreciate It Had to Be You as it is a rather enjoyable book. Churchill does a wonderful job with setting, dialog, and characterization. But other than the curiosity of the timing of the murder, there's not much intrigue here. Unfortunately, the real mystery of It Had to Be You is why Churchill didn't follow through on answering a key question raised during the murder investigation.